Sunday leftover Roast chicken and Chestnut mushroom Risotto. Some think that Risottos are scary and problematic. For me, I’ve always been able to knock out a good one. Maybe it’s my knack, I feel I can inject passion into risottos and pastas, so potentially my calling. On Monday, I endured as many do a pretty arduous day at work. Things are not particularly great work wise at the moment. Think it’s Brexit waves that are causing unease in my particular case. I arrived home however in a good mood, this is due to the fact that I have now taken up swimming every morning before work in the intention that I will be less stressed and moody. This has been working well until I pulled up in front of my house. I glanced up at my bedroom window, the light was on so knew the husband was home and probably watching TV. I don’t have a problem with the husband watching his favourite shows. I do have a rule though that whoever is first home should make a little effort on the aesthetics of the domestic dwelling. I sadly wasn’t feeling the domestic vibe, as the way the curtains and blinds were arranged was a dead give away of what was to come. I looked at Jenny’s house next door, spotless curtain arrangement as always, and walked slowly to my front door. It didn’t get any better. The washing up was still there from the previous evening, plus extra. The dog had displayed his affection in the liquid form despite the french doors being open so he may come and go as he pleases to the garden. I decided a little vino would be appropriate at this point, the husband popped his head into the kitchen and asked why I was drinking. I noticed he had a funny hat and glasses on and wondered if I’d missed something or was this a vague attempt to cheer me up or was this now his new look. I told him to leave me alone to get back control of the kitchen and my inner peace, tidied up whilst mumbling and cracked on with supper. I grabbed a large pan, glugged a generous amount of olive oil into it, chopped a large onion finely, two garlic cloves and fried gently for 2 minutes. I added 3 teacups of Arborio rice and coated it so it reached the translucent stage. I then added in half a punnet of chestnut mushrooms, a glass of dry white wine and a pint of chicken stock. The next 18 minutes of your life is crucial to your Risotto’s success. 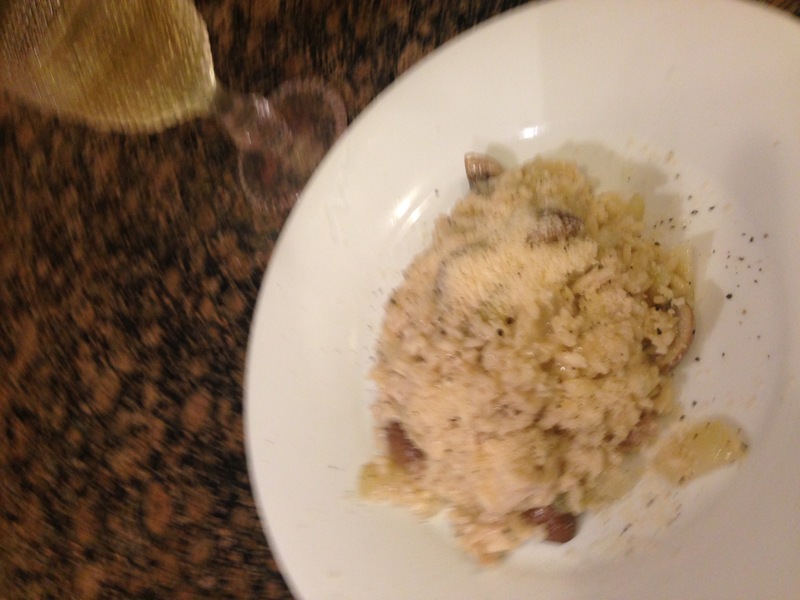 I like a wet risotto with a bit of Al dentiness, so took to my stirring a nurturing. This is the stress reliever bit, and does wonders for me. After 13 ish minutes I added my chopped leftover chicken ( around a breast and a half), stirred for a further 3 minutes, then finished with some chopped Tarragon, a good knob of butter, lashings of Parmesan and some black pepper. I was ready to be nice, so called the hubby from wherever he had scurried off to…. Author Just Delight MePosted on 23/11/2016 Categories One pot wonders and Slow Cooker sensations, Rustic recipesTags Brexit, chicken, domestic, marital bliss, Monday night, Risotto, stress reliever, vino, wineLeave a comment on Sunday leftover Roast chicken and Chestnut mushroom Risotto. Lazy Monday one pot roast chicken. I was away this weekend so didn’t manage my token hour of ironing or my weekly roasting of anything mildly interesting ( usually chicken). Tonight I sniffed that my boys felt they had been hard done by, and myself still in the recovery position from several quaffable whites, 3 glasses of champers, a smooth côtes du Rhône, and five baby guinesses ( sang to the tune of 12 days of Xmas) thought that dinner should not be an almighty affair. Here’s what I did…. Bought a smallish chicken ( only 3 of us, feel free to upgrade) placed into a roasting dish with a quartered onion, 3 garlic cloves, 200 grams of New potatoes, and roasted with a glug of olive oil at 190 degrees centigrade. After 40 mins, Chucked in 5 halved carrots, tossed about with some Tarragon. Then 15 mins down the line, added 100 mls of dry white wine, 100 mls of water, a chicken stock pot and 2 handfuls of garden peas. A big mix and you have your favourite flavours with minimum effort. I served with a Yorkshire pud and some cauliflower cheese. Monday delight!! 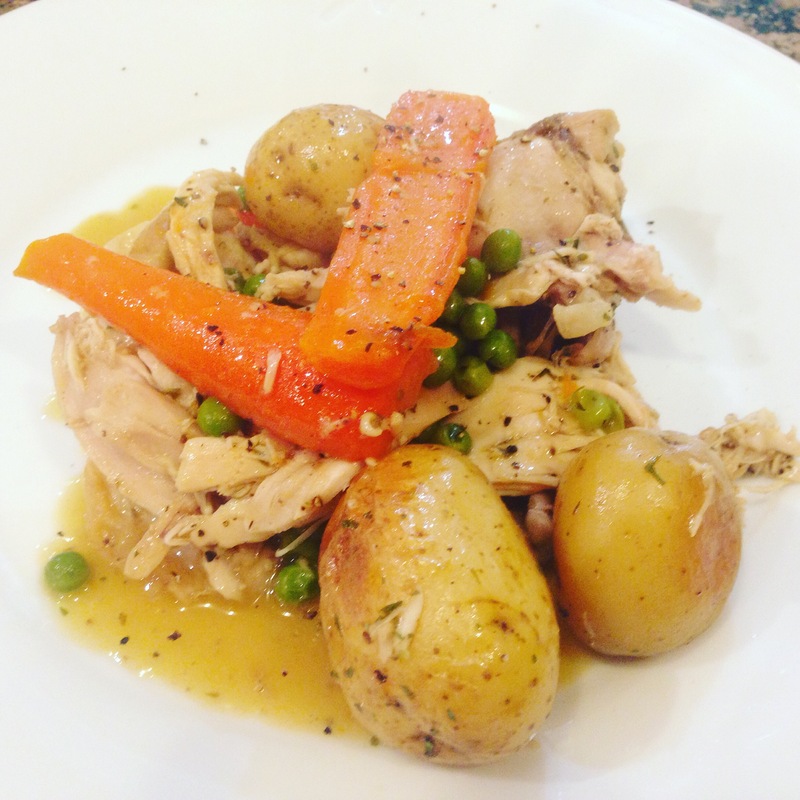 Author Just Delight MePosted on 25/10/2016 Categories One pot wonders and Slow Cooker sensationsTags chicken, Monday night, no fuss, one potLeave a comment on Lazy Monday one pot roast chicken.